Cottage Paper: Best Stampin Up! Deal Ever!!! Best Stampin Up! Deal Ever!!! This deal extended until midnight Tuesday October 22!! As part of their 25th Anniversary Celebration Stampin' Up! has announced a fantastic promotion. If you become a Stampin' Up demonstrator between now and October 21 the sign up fee is $25.00. Why this might be of interest to you? 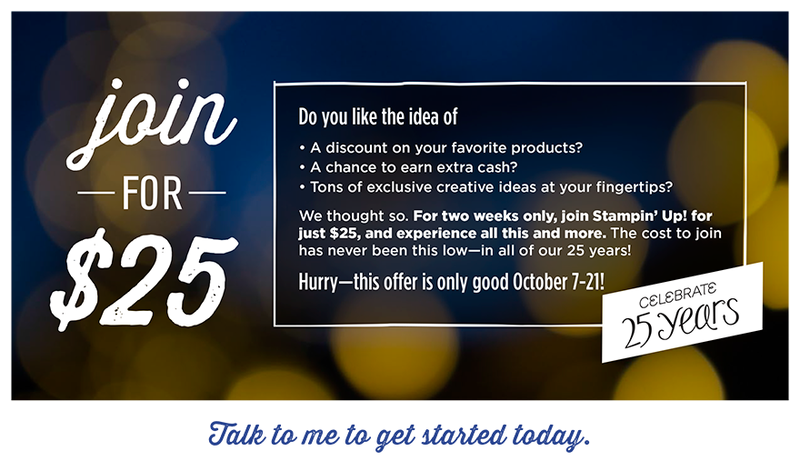 For $25-$27 (more about that below) you get $25-$27 worth of Stampin' Up! Product. Ok, so far that doesn't sound like much of a promotion but keep reading! You will receive a 20% discount on anything you order until the end of April or for as long after as you remain a demonstrator. If you place an order for $150 or more within 45 days of your joining you will receive an additional 10% discount for a 30% total discount. You will receive advance access to the Spring Catalog and Sale-A-Bration promotion with the Spring Catalog available around the first of December. You will be in the know about all the latest Stampin' Up! info and news. If you join under me you will be part of the most amazing papercrafting group ever - Stampin' Pretty Pals!! Mary Fish, www.stampinpretty.com, and Brian King (named first male Stampin' Up Rising Star), www.stampwithbrian.com, will be part of your upline. They are two phenomenal people. Mary has a Stampin' Pretty Pals Facebook page which provides a way for all of us to communicate, share ideas, and ask questions. In addition she holds monthly webinars to discuss all the Stampin' Up! news and the latest products. This last weekend Brain and his upline Pam Morris assisted by fellow PAL Kate McGoin hosted a fantastic PALS event in Atlanta. I addition to the quasi-local people, like me, who drove to Atlanta, six PALS flew in from all over the US. I will be posting more about the event in the next few weeks but Brian has already posted lots of pictures and info on his blog which you should check out. I noticed that one of the commenters on his blog said, "I don’t want to be a demonstrator, but your weekend made me think about it."! All of this with no obligation on your part to do anything more! Now how to join. Pick product(s) which total(s) exactly $25-27 before taxes. This can consist of many items or one item. It just has to total $25-$27. Then email me and I will help you with the registration process. But you may want more stuff than that! Once you have joined and your order is on its way you can immediately place another order - large or small - and you will receive your 20% discount! Plus if you want a lot more stuff you can receive 30% off your first $150 order placed within your first 45 days. What is not to love!! To make things a little easier I have created a list of individual items which fall in the required price range. There might be something on the list you have been interested in. If so, what a perfect time to act - no calculator needed! Here is my list. Please email me with any questions or put them in the comments below! Stay tuned for more about our fabulous event in Atlanta.